I used to think that wine snobs turned their noses up towards unoaked Chardonnays, that the general demand was for rich, buttery Californians that carried a lot of body and flavour intensity. But then I googled unoaked Chardonnay, and I was wrong. Wine writers are taking note of the unoaked, Chablis-style Chardonnays. In fact, a trend in California is now to age their chards in stainless steel vats, toning down the richness and allowing the varietal to show more of its primary flavours. The Okanagan region is embracing the unoaked style of Chardonnay as well, and my mother-in-law and I spent some time sampling some of these wines to see how BC does it. We tasted three different unoaked Chardonnays from different areas of the Okanagan wine region. Nk'Mip's 2011 Winemaker's Chardonnay is partially aged in French oak but the natural flavours of Chardonnay stand out with notes of grapefruit, lemon, green apple and zesty acidity. Hints of straw on the finish give the wine body and finesse. Blasted Church's 2013 Unorthodox Chardonnay opens with a lovely bouquet of orchard fresh peaches and honeycrisp apples due to small amounts of the aromatic varietals Ehrenfelser and Gewurztraminer blended in. The palate reflects flavours of honeydew melon and a steely minerality that leads into a citrus finish. Pairs well with scallops and lean white fish. Gray Monk's 2014 Unwooded Chardonnay has a flavour profile that is consistent with the other two wines above, with notes of green apple, underripe peach and a hint of green banana on the palate. Fresh acidity with a zesty finish, this wine is ideal as an aperitif or on its own in pleasant warm weather! It was interesting to note that none of these wines underwent malolactic fermentation during the winemaking process. The trend here is to showcase the natural fruit flavours that come with the varietal. Now that Spring is here, light white wines will surely be returning to the forefront of winelovers' minds when the sun is shining. Why not celebrate Spring with one of these fresh and lively wines? Your tastebuds will thank you. Tale #1: A Cheddar "Battle"
Sommelier school is expensive. Really, really expensive. When I first expressed my interest in pursuing this passion to my husband, and after showing him the tuition costs, I really thought he would say no. After all, we are saving up for a new house and need all the money we can save for the down payment. And I'm not necessarily going to chase this as a new career path. However, to my surprise, he was very supportive of me and I just finished the Wine Fundamentals course through WSET! To thank him for his support and to show him that I did learn something in exchange for tuition fees, I cooked him a three course meal that focused on a couple forms of cheddar, complete with wine pairings. First course was a slow-cooked French Onion Soup topped with broiled, mild cheddar on baguette slices, paired with a Chardonnay, 2008 Tinhorn Creek from BC. This chardonnay is medium bodied and doesn't go overboard with oaky flavors, and because of this I found it to be a great match with the soup, bringing out the rustic flavors of the onions. I'm not much on chard, but this one is great to pair with food or drink on it's own! Next time I will use a stronger cheddar for the soup, which I will make again! Dessert was an apple crisp with mild cheddar woven into the topping. I don't think I will ever make an apple crisp without cheese in it ever again! I wanted to pair it with my sacred bottle of Robert Renzoni's 2008 La Rosa, a 2008 Californian rose made with Sangiovese grapes. But because this is the bottle that has the Renzoni autograph on it (and I don't know when I'm going to that area of California again), I couldn't pull the cork, so to speak! So despite the missing wine pairing with dessert, the meal turned out well and needless to say, my husband was all full up in the end! The title comes from my dad, who used to sing the Easter Parade song to me and my sisters every year. Even though I live 3,000kms away now, he still "sang" it to me in the Easter card he sent. Easter is a big holiday for my family. They all get together, have a feast, and they never forget the wine! Easter is one of the three days I get a little homesick, not being able to to join in the fun back home. 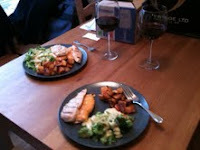 To help ease the homesickness, I made us a 3 course meal, and I didn't forget the wine pairings either! I chose to do a "best of" theme for our food adventures this past year, with hints of my Ukranian background to complement the meal. First course was kielbasa and brick cheese infused with onion and parsley, paired with an Australian Shiraz, Wyndham Estate's 2008 Bin 555. Originally I wanted to pair it with a more mellow red since I find Shiraz has quite a bite for my tasting with it's peppery notes. This wine still maintains the quality of a good Shiraz, without slapping you in the face with spice. It paired decently well with the kielbasa and cheese, but I think I'll keep trying different wines to pair with kielbasa in the future. The wine pairing was my personal favorite white: Hernder Estate's 2008 Vidal, which you can only get in Ontario. It's light to medium bodied, very floral in bouquet with a sassy hint of lime. It's sweet but not overly sweet, so it brought out the sweetness of the chicken without making the main taste too sweet. Dessert was originally going be a spiced banana rum cake, but since we still had chocolate fudge cake leftover from Friday night's family dinner, we ate that instead and paired it with a rum and coke to help kill the sugary flavors. A fantastic ending for a fantastic dinner! Now it's time for me to take a break from three course dinners with wine pairings. Back to the regular family tradition of Slow Cooker Sunday, which will be my personal take on my nana's "Floating Chicken". Now off to the wine store to pick up the wine I'm going to use in that recipe!